One of Alexander McCall Smith’s lesser known series, is a comic one featuring the pompous bumbling Professor Doctor Mortiz-Maria von Igelfeld, pillar of the Regensburg’s Institute of Philology. His scholarly but rather obscure topic of Portuguese Irregular Verbs is one that he misguidedly thinks everyone must be as enthralled about as he is. The funniest thing about his character is that he continues to get into all sorts of trouble, mostly caused by his own self-importance and social awkwardness. For example, von Igelfeld, thinking he is going to attend a linguistic conference, realizes too late that he has mistakenly stumbled into a veterinary surgical gathering and ends up amputating a dog’s legs! He redeems the situation by designing a contraption for the poor animal so that it can still get around. 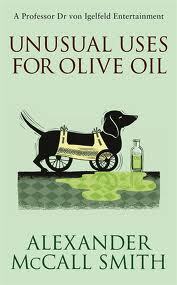 The dog actually reappears in the ‘Unusual Uses for Olive Oil’ (also on its cover) when the device ends up needing a bit of maintenance. On the romantic front, a woman who is bored by the Professor’s self-absorbed conversation about his work, makes the observation that Portuguese Irregular Verbs are not very romantic. Von Igelfeld thinks this is hilarious because Portuguese is considered to be a Romance language! The humour is subtle and often becomes situationally slapstick in a Detective Clouseau kind of way. Like when he accidentally joins a mountaineering group and ends up doing some rather advanced climbing with near disastrous results, but ends up saving the day by being philosophically inspirational about it. 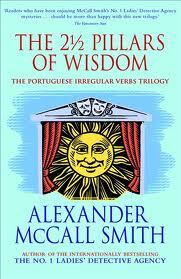 Originally published under three separate titles, ‘The 2 1/2 Pillars of Wisdom’ is the collection of all three of the first instalments (Portuguese Irregular Verbs, The Finer Points of Sausage Dogs, and At the Villa of Reduced Circumstances). ‘Unusual Uses for Olive Oil’ comes next and continues with more hapless adventures and satire about the world of academia. 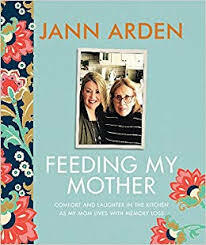 This entry was posted in Fiction and tagged 2 1/2 Pillars of Wisdom, Alexander McCall Smith, Unusual Uses for Olive Oil. Bookmark the permalink.